On January 16, 2019, I posted a blog about the value of partnerships and in particular, our Parent Teacher Associations. Read it here. The partnership between MCPS and the PTA is one of the most essential to student well-being and learning. Montgomery County has a strong, vibrant and active system of local school PTA chapters, with an active and committed board of county officers. I meet with the County Officers on a regular basis and I appreciate our collaborative work. This month, one of the officers, Tracie Potts shares her thoughts. Thank you, Tracie. I learned a lot about families, teachers and students standing in the rain. It was the morning of our middle school’s first Run/Walk for Breast Cancer. As then-PTSA President, I’d worked hard with our SGA advisor to pull it off. We found local businesses to donate T-shirts and snacks and ordered ball caps for participants. Our volunteer fire department was on standby. Race bibs with our custom logo were ready to go. More than 100 people registered. I was so excited! Then the skies opened up with a vengeance. An hour before the event, it was pouring. My heart dropped. I thought surely no one would show up. To my surprise 70 people did, including one mom I’ll never forget. As everyone huddled in a hallway trying to stay dry until race time, one mom arrived with an umbrella, a middle schooler and two little ones in tow. She told me they walked a mile to school in the rain to participate. Why? Because buses don’t run that early on Saturday, her work schedule prevented her from attending weekday PTA meetings or school events—but she and her kids really wanted to do something together to support the school. The sun finally broke through, enlightening our event and my thoughts about how PTAs and schools can work together to engage families. I learned that parents who don’t show up for conferences or movie nights do care. They’re just busy supporting their families. PTAs and educators have a responsibility to work together to create opportunities for all families to be involved. That race only happened because I teamed up with a fantastic math teacher. She knew how to organize races. I knew how to find sponsors and get families there. Together, we made a good team. What does the parent-teacher partnership look like at your school? The “T” in PTA is important and always has been. PTA started more than 120 years ago when parents and teachers decided to work together to create a powerful voice for children. That’s still our mission. Today, there are nearly 4 million PTA members in all 50 states, empowered to improve the lives of children. Over the years, PTAs have rallied for everything from healthy school lunches to art classes, and from school safety to making sure children get enough sleep. Take a moment to see what we’ve done and how we’re taking action. In Montgomery County, more than 40,000 PTA members are working to improve the lives of children with partners like MCPS. Earlier this month, we co-sponsored our 2nd Annual Mental Health and Wellness Forum, which included Mental Health First Aid training. As a result of our partnership, 40 more adults in our county are now certified to recognize and deal with mental health issues among children and teens. We expect to train 160 more before the school year ends. That’s partnership making a real difference. We’re also seeing parent-teacher teamwork in action at individual schools. I’m reminded of that every day as I drive past our middle school and see the new roof covering a renovated science wing. Or the traffic light in front of our high school, making dismissal safer. Both were the result of years of local PTA advocacy involving parents, teachers and administrators. Why do we do it? For our kids! I have two MCPS students. They are my motivation. 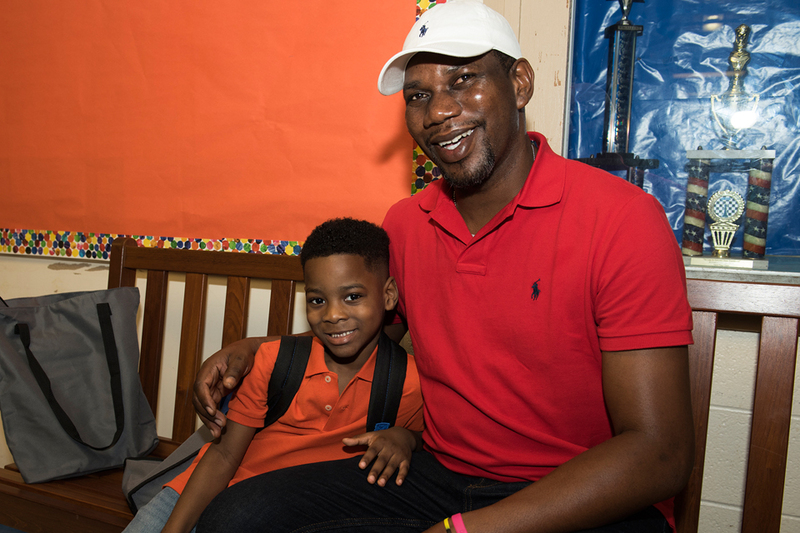 My heart skipped a beat when my kindergartner broke loose from my grip on the first day of school—but looked back to see if I was still watching. Or when my son scans the audience at a band concert to see if I’m there. Or when my daughter beams with pride watching me read her essay. They may not say it, but they love when we show interest. You are the most important person in the world to your child. When we find ways to engage in their education – at home or at school – we show them how important they are to us, too. The most important thing I’ve learned in more than a decade of PTA advocacy is that YOUR VOICE MATTERS. YOUR VOICE MATTERS to your child, and for their future. If you haven’t found your voice yet, take a look at Superintendent Smith’s blog, The Power of Working Together. He offers easy, practical ideas for family engagement. Or take a look at what our PTA Council is doing—there are many opportunities to explore issues you care about.